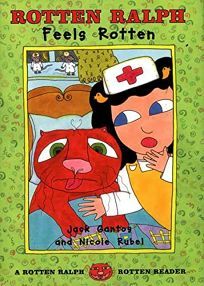 For kids anxious about a trip to the doctor, their favorite feline may offer some assistance, in Rotten Ralph Feels Rotten: A Rotten Ralph Rotten Reader by Jack Gantos, illus. by Nicole Rubel. After he feasts on a ""green chicken wing,"" ""furry fish"" and a carton of ""chunky chocolate milk"" from a garbage can, Ralph needs to visit the vet. It isn't long before Ralph's rottenness is back in full swing. .